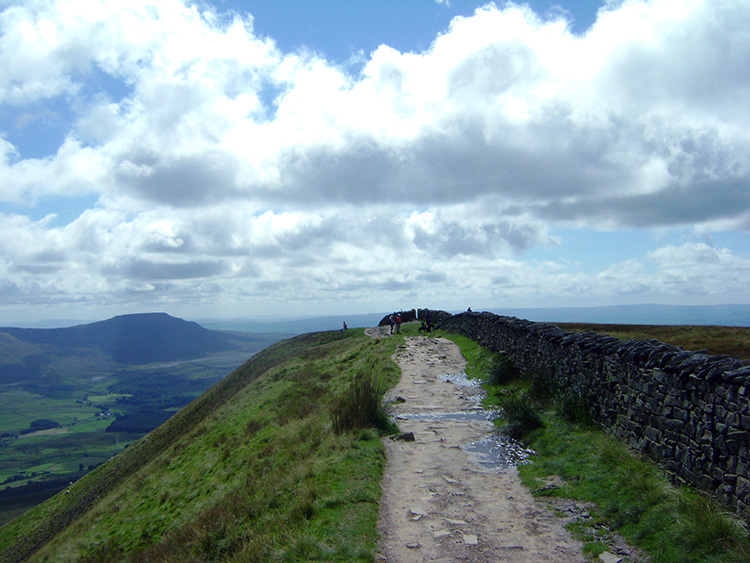 Summary: This walk is the classic way to climb the highest mountain in the Yorkshire Dales National Park. 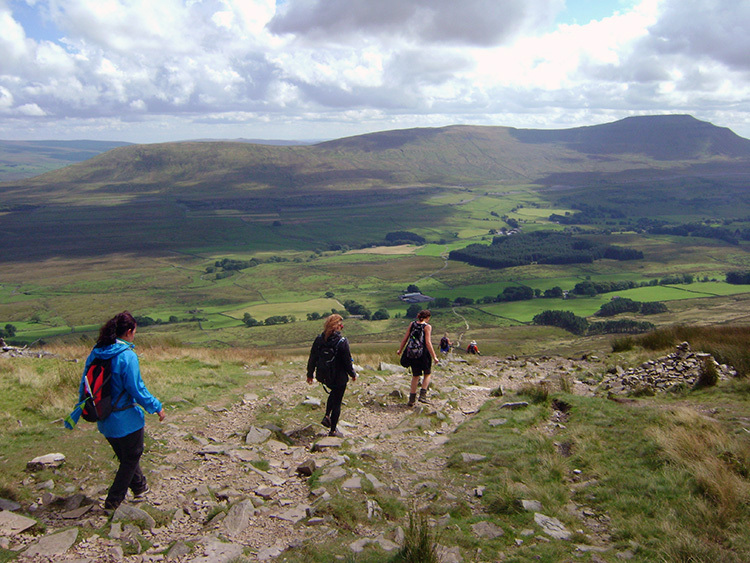 And it is the best way to make the ascent of Whernside too as there are stunning views of the Yorkshire Dales landscape to be enjoyed all the way around this excellent circuit walk. The walk is essentially a long climb to reach a wonderful approach ridge which after summiting the mountain is followed by a steep descent and a finale of a pleasant rambling return along lanes and past a couple of farmsteads to the starting point. 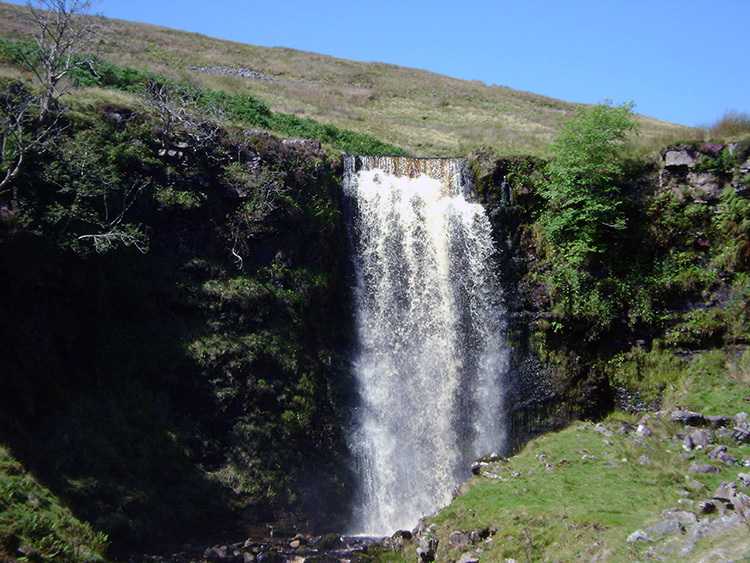 There are couple of optional extras during the walk on offer, first a short diversion to Force Gill Waterfall which is as good a waterfall as any in the Yorkshire Dales after significant rainfall and secondly to the Old Hill Inn at Chapel-le-Dale should a pub lunch or refreshments be part of the agenda. The Walk: It was a lovely day with plenty of sunshine showing on the morning weather forecast map. It has not always been so promising on my walks to Whernside. I remember one occasion when I had walked with Dave and Steve from Ingleton via the waterfalls and Twisleton Scars. It was winter and by the time we had reached Hard Rigg snow had started to fall. By the time we had reached High Pike we we walking through thick snow and by the time we reached the gate near Skelside it was knee deep. We struggled the last few yards to the summit in a snowstorm and sheltered by the trig pillar to eat lunch which proved very difficult to do. Despite wearing gloves and proper winter gear our hands were quite numb. I still recall fumbling to hold my sandwiches and enjoying the necessary pleasure of clasping my hands tightly around my hot flask. After eating our lunch as efficiently as we could we got off the mountain quickly. Today though I knew I could linger and enjoy my time at the top. After arriving at Ribblehead Viaduct I had a cup of tea provided by the lady at the mobile cafe parked up beside the B6255 Hawes to Ingleton Road. It is usually there, a four seasons convenience. 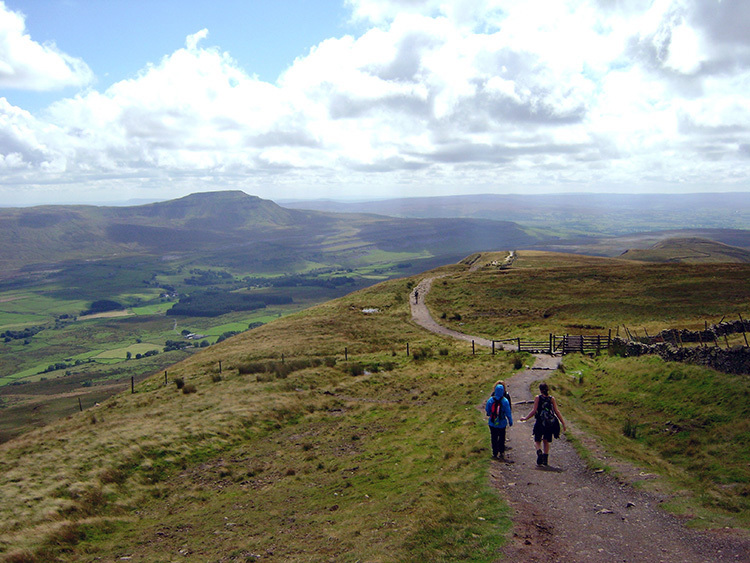 It gets a fair deal of patronage from walkers on a circuit of Whernside or on a circuit of Ingleborough or indeed those on a circuit of both the mountains either side of Chapel-le-Dale. The mobile cafe gets service from walkers on the demanding 25 mile Three Peaks circuit of Pen-y-Ghent, Whernside and Ingleborough too. As well as the walkers the enterprise draws business from day trippers passing along the road in cars who do not venture much further than the roadside. The location is a very popular setting for photo shoots and selfies and why not with the backdrop of Ribblehead Viaduct and Whernside making for a wonderful picture. I enjoyed the picture while enjoying my cup and tea and while setting off on the walk. The view of Whernside shimmering in the bright summer sunshine enticed me on and past those enjoying the setting of Ribblehead Viaduct. Some were family groups enjoying a picnic. 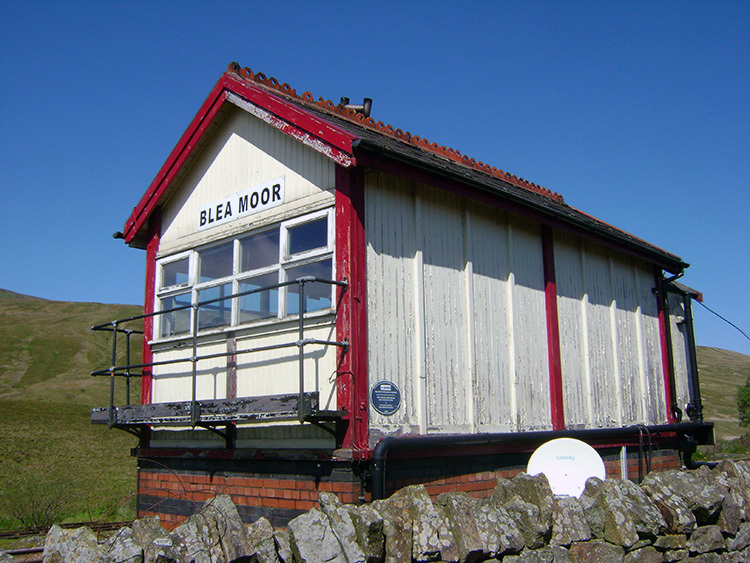 The first mile of walking is on a very gentle ascent to Bleamoor Sidings. 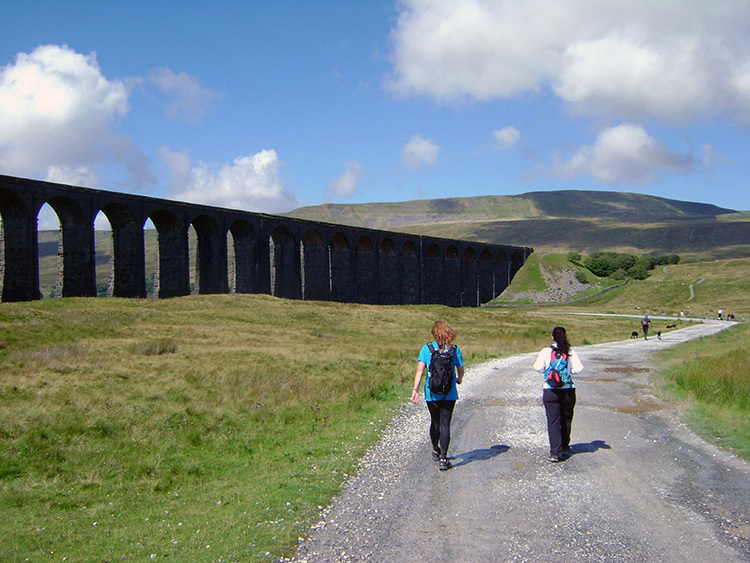 The first part is enjoyed passing the twenty four arches of Ribblehead Viaduct and the second part is equally enjoyed on the good path running parallel to the Settle to Carlisle railway line. The bonus of trains passing by as you walk this section is always a delight and if you can see passengers give them a wave. They will most likely smile and wave back. This scenic line attracts friendliness; it is not a grim commute but rather a pleasurable journey. 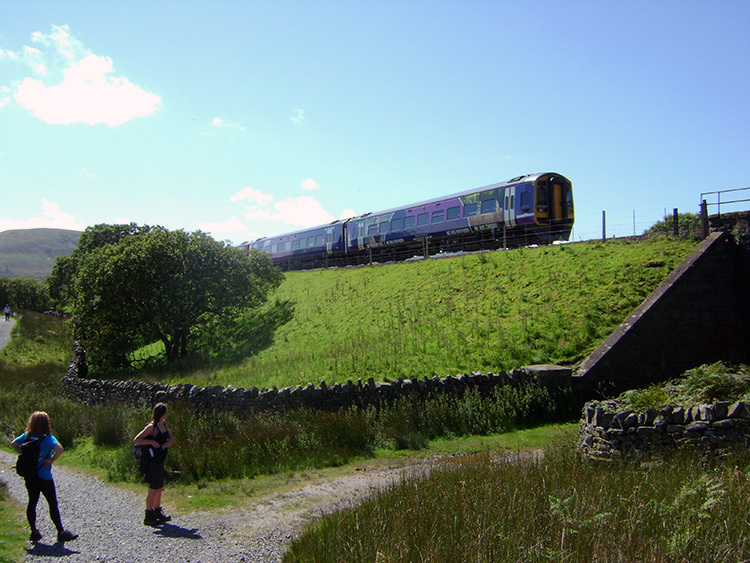 When I travel the Settle to Carlisle line the railway guards and volunteers are often on hand to help passengers enjoy the journey further with stories about the railway and information about the views to be enjoyed. I reached Bleamoor Sidings where there there is a well maintained railway hut and a derelict railway house. Once inhabited by a member of railway staff and his family it is now inhabited by House Martins. Plenty were flying in and out of the broken windows and gaps in doorways as I walked past. After passing Bleamoor Sidings the path veered away from the line parallel to the railway to follow Blue Clay Ridge northwards towards Little Dale. The sky was bright blue all over with little sign of cloud. It was the best of days for walking and enjoying the views which were beginning to unfold. While it was a sunny mid August day it was not too hot and consequently there was no humidity to haze out the distant views. I was enjoying near perfect visibility and after descending the short drop from Blue Clay Ridge to the point where I could ford Little Dale Beck I stopped short of the wade across the beck and looked back southwards towards Bleamoor Sidings. 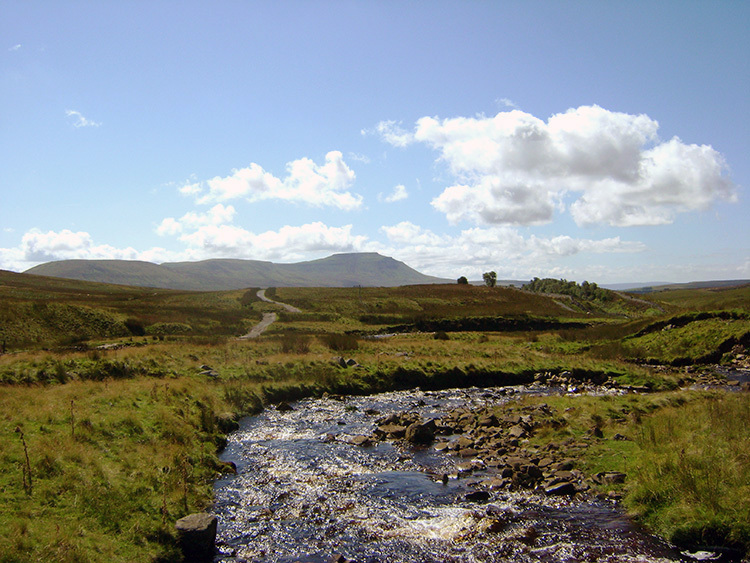 Beyond the shimmering waters of the beck and the ridge was the attractive form of Park Fell, Simon Fell and Ingleborough. I thought to myself "I have not walked the line from Park Fell to Ingleborough yet". I resolved to do so soon but in the direction of Ingleborough to Park Fell in order to fully enjoy the views of the ridge line. 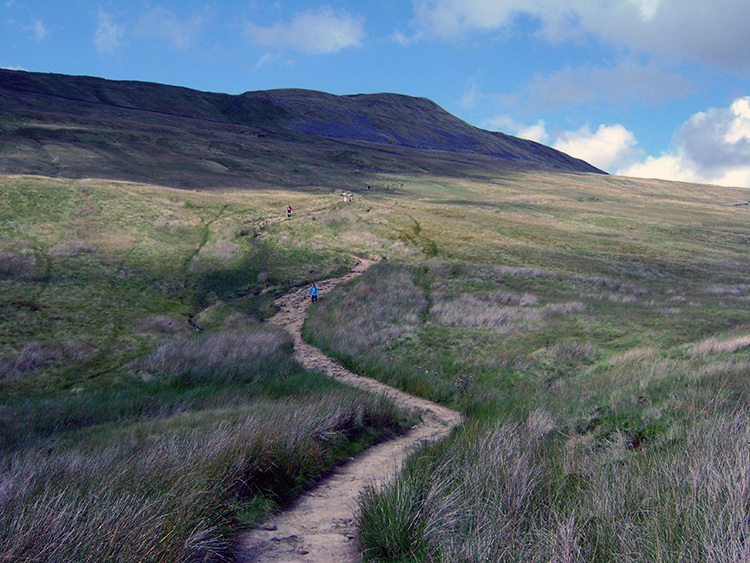 For now though I had the Whernside ridge to look forward to. I cannot help it. I often see a sight on a walk which entices me to deviate from the original route I had planned. It was happening again. Just after I had left the east fringe of Blea Moor and crossed over the railway bridge and Aqueduct of Force Gill at Smithy Hill I spotted the waterfall. And I could see it was surging with a torrent of water cascading over its lip after the past day and night of heavy rainfall. Force Gill Waterfall is one of the most impressive waterfalls of them all in the Yorkshire Dales when it is in full spate. Today was such a day and while all the other walkers of Whernside and of the Three Peaks I was in the vicinity of kept to the main footpath I left it. I followed Force Gill upstream into the small gorge of the waterfall and stood in awe looking at it up close. It thundered with power and pride as I stood in my personal auditorium. It was a couple of rapturous minutes, highly thrilling. After dragging myself away from the super show I resumed the climb to Whernside, first on the good path up to Grain Head. The climbing had intensified now. It was about 5% up to Smithy Hill. It was over 10% from Smithy Hill and would stay about that all the way to the top of Whernside. What the climbing took in energy it gave in distance views. Those on the Three Peaks could now clearly see Pen-y-Ghent which they had climbed earlier in the day and they could see the route they had taken from Pen-y-Ghent to get to where they were standing. Between the first of their Three Peaks mountains and their present position they could see the architectural splendour of Ribblehead Viaduct and now appreciate the gentle curvature of the line which is not obvious to see from Ribblehead. There it looks as if the line is in a straight line which it clearly is not. The viaduct is actually shaped like a boomerang. Turning back around from my view of the viaduct I focused my attention on Knoutberry Hill and climbed. 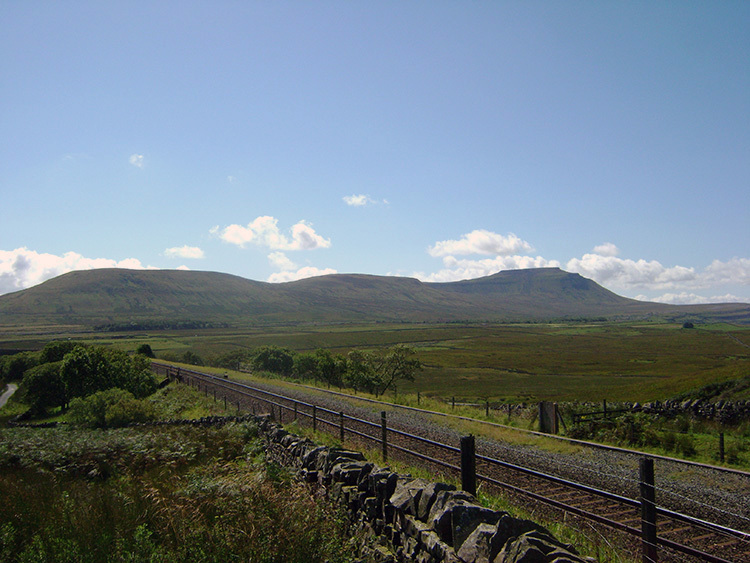 At 645 metres high Knoutberry Hill is at the northern end of the Whernside ridge line. After Knoutberry Hill it plunges down to Whernside Tarns and then to Boot of the Wold which I have crossed many times when walking between Ribblesdale and Dentdale. 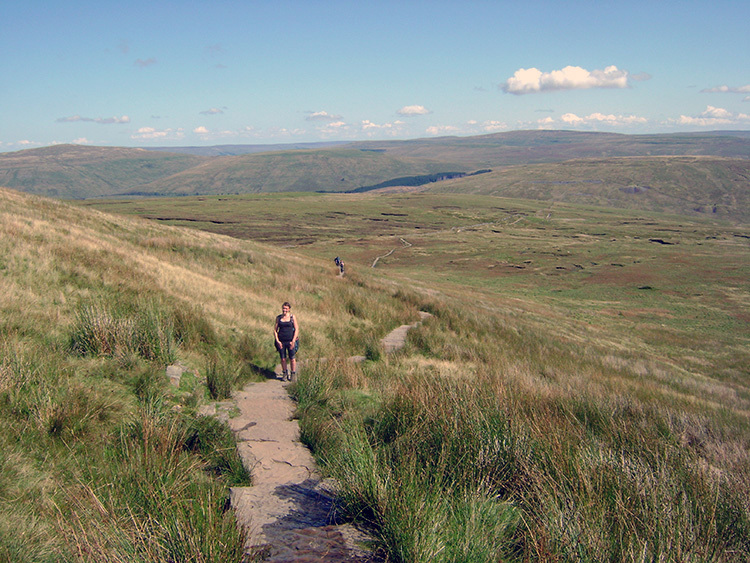 During the final climb to Knoutberry Hill the heights of Whernside and its most attractive ridge line comes into view. From this aspect Whernside is a fine and indeed attractive hill, not at all like the uninteresting bulk portrayed of it in many walking and landscape books of the area. From the right angle Whernside is as beautiful as many and it should be lauded not maligned. Shame on the literates who shame Whernside. 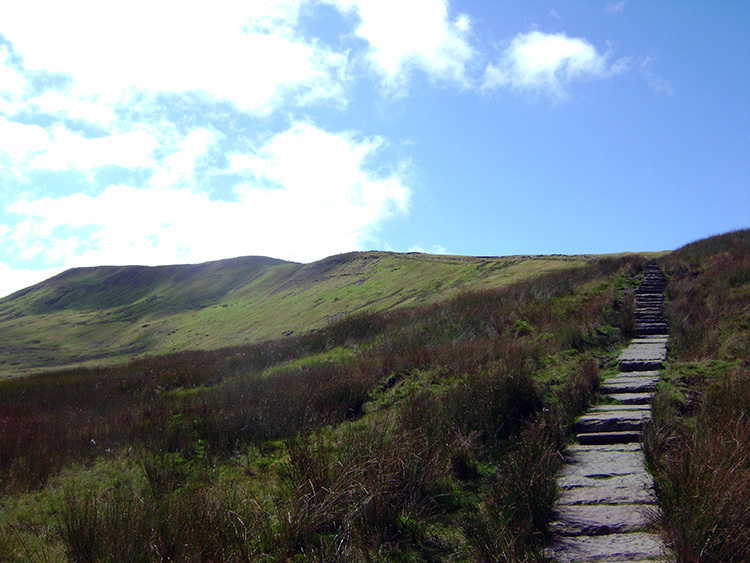 And there is more to which Whernside should be lauded about. I am coming to that. 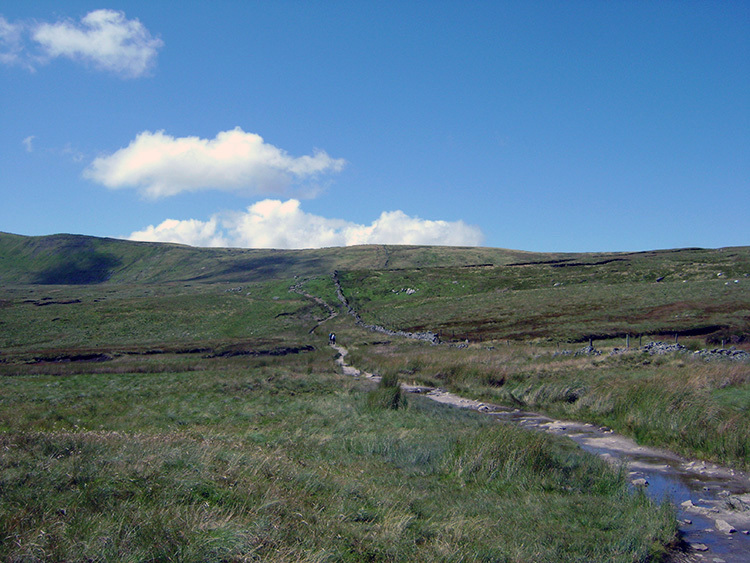 Once Knoutberry Hill is scaled the walk to Whernside turns its course from west bound to south bound. The final approach on the thrilling ridge top to the summit has begun. It is a ridge line. with the most exciting views. The sweeping uplands of the Yorkshire Dales are best appreciated here. It seems to go on forever. For example turn and look north and east across Wold Fell and Widdale. Look north across Dentdale which has now appeared in view. Look to the vast wild expanse of Great Knoutberry Hill and imagine a wild day on it. Look beyond Dentdale to Alfred Wainwright's slumbering elephants, otherwise known as the Howgill Fells. 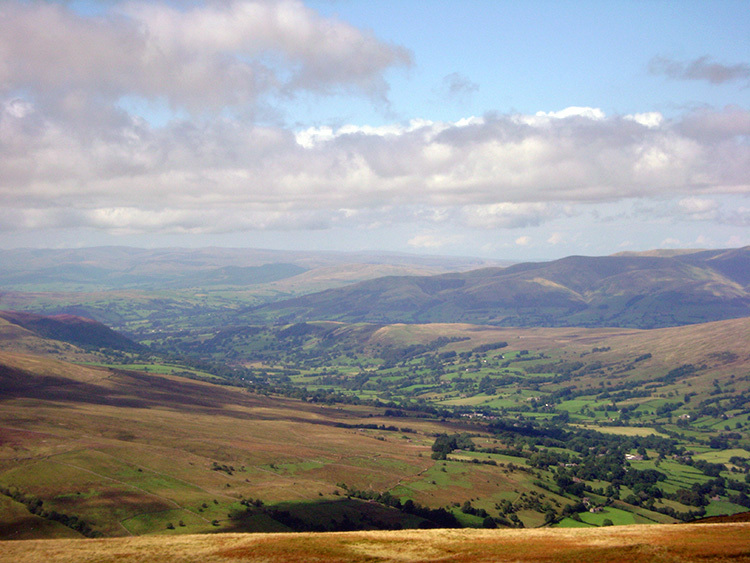 Look beyond the Howgill Fells to the Eastern Lake District. It is there to be seen. Whernside gives in plenty. 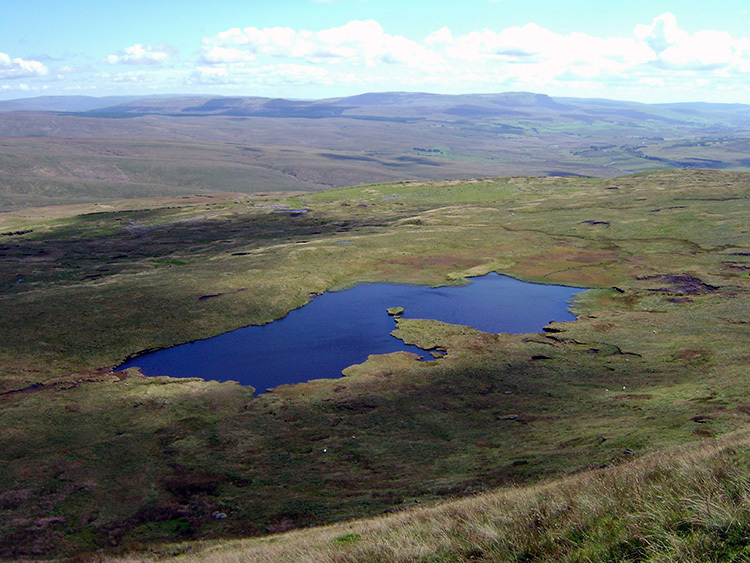 And look down to Greensett Moss Tarn which with a little imagination has a shape of Australia. 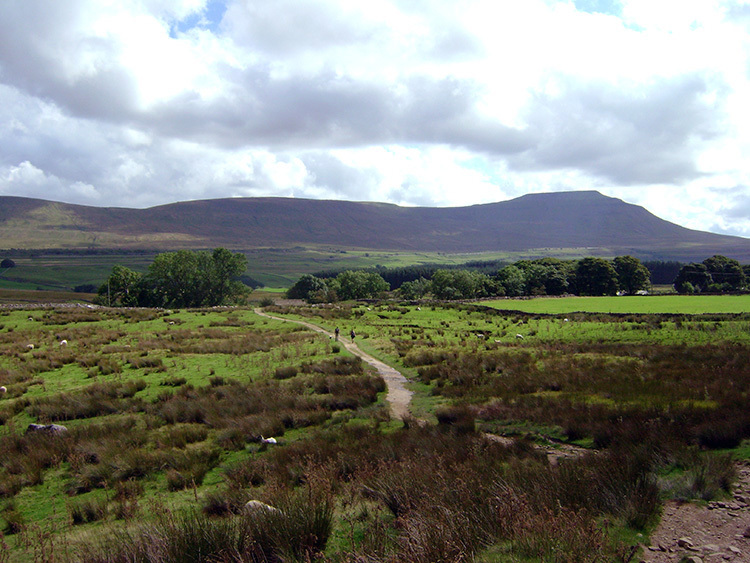 Those other two of the three peaks which are rightly praised when Whernside is not do not have an impressive tarn. Greensett Moss Tarn is a beauty. I continued to enjoy the remarkable views on offer while I walked along the ridge from north to south in my endeavour to reach the summit. I was not alone, a steady line of walkers were walking the ridge with me. Most were on my course but a few were going the other way. I passed a group of about six mature gentlemen heading down in the opposite direction, all around my age or perhaps a little older. One said to the rest of his group "Let's jog down". He set off at a steady jogging pace. First one followed his lead and then another. I looked back to them after walking another minute up the ridge line. while was leveling off. 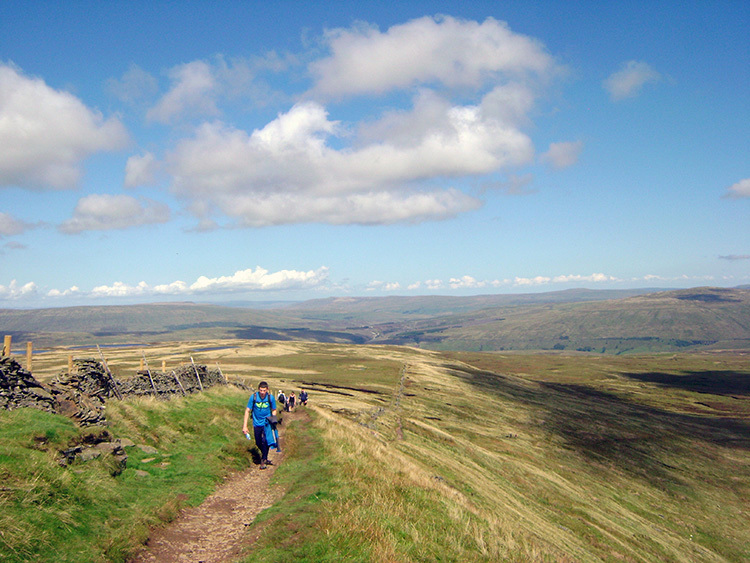 All of them were now jogging down from Whernside. Good for them. I continued up to the roof of the Yorkshire Dales while continuing to enjoy the remarkable views and while acknowledging to myself that I had never enjoyed better conditions on Whernside. "At last" I thought. Cloud was starting to build as I made my final approach to the summit. It was building in lines to the south while the sky to the north showed no intention of filling. I knew it would remain OK and so it was to prove. On reaching the trig pillar there were plenty of people there celebrating the feat of reaching the top. 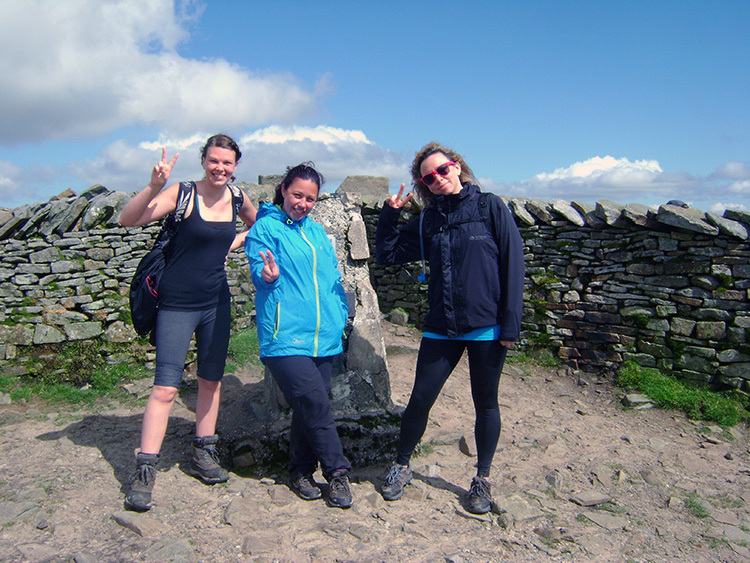 There always is as Whernside is the top of the pops for hill baggers. It is the highest mountain in the Yorkshire Dales. After helping a couple of triumphant groups in photo shoots I retired to the nearby shelter and enjoyed my lunch. Uphill done, downhill to go. While the climbing was done the spectacle of sumptuous views was far from over. Leaving Whernside by the south-west route to High Pike fills the eyes with the most wonderful sight down to Chapel-le-Dale and across to Ingleborough. 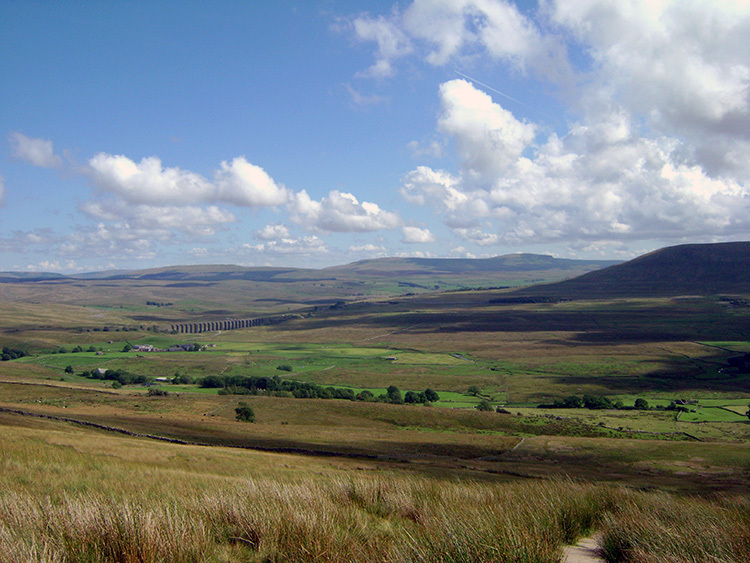 It is an awesome panorama which is completed by looking directly down the line of the Whernside massive to High Pike, Low Pike and to West Fell which leads straight down to unseen Twisleton and to the Ingleton Waterfalls. It is an enticing draw to follow a linear line and take that route all the way to Ingleton. One I have done a few times before. This time though its a circuit to follow and back to Ribblehead. The descent to Chapel-le-Dale is fairly steady at first, Don't be fooled. From near Low Pike the path turns from a south-west course to a south-east course and when it does so it steepens, crashing down into Chapel-le-Dale at a 20% to 25% gradient. Believe me, it is a descent which has to be respected and taken with the utmost care. On a few occasions I have slipped and ended up on my bottom on this descent, sometimes painfully. Only at Bruntscar can you relax, when the deed of descent is done. There are times on the descent when stopping and taking a rest is to be advised. Anyway, do so because the view across to Ribblehead Viaduct and Pen-y-Ghent is stunning from this point. Take it in. It is one of the memorable ones. From near Bruntscar a decision has to be made. Immediately following the steep descent a junction of paths is reached. Turn right and you will head towards Chapel-le-Dale. 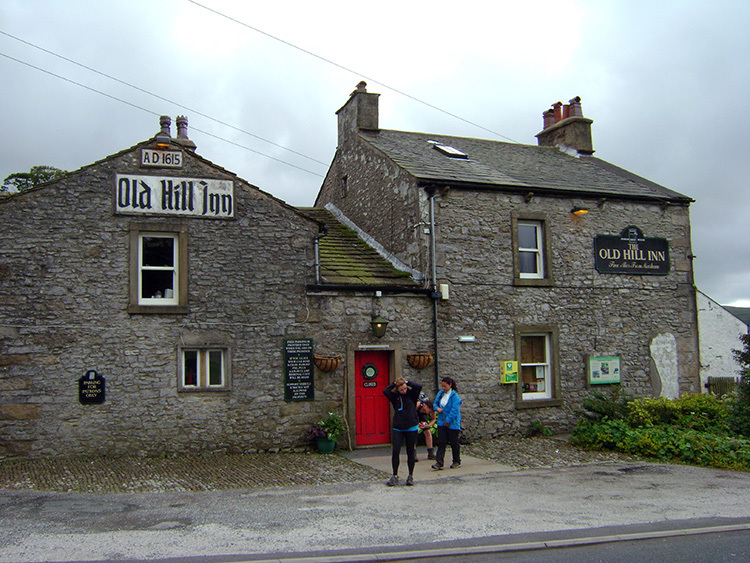 This route is necessary if you plan to go to the Old Hill Inn. 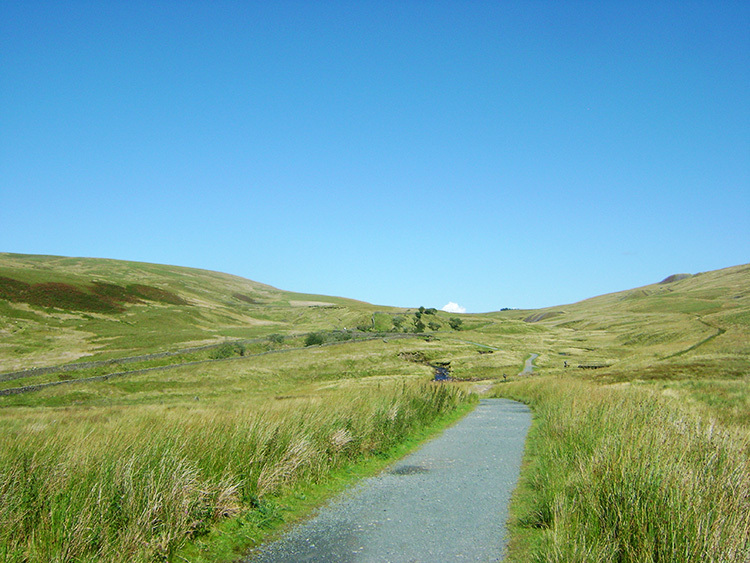 From there though you must return to the junction to finish the walk or alternatively walk along the road back to Ribblehead Viaduct. Turn right at the junction and the path leads north-east to Ivescar from where a choice of paths lead across the dale back to Ribblehead. The attached route files show my favourite. It is a fine way to end a fine walk. In conclusion I hope this walk helps convert you, if you need converting that is, into thinking what a brilliant mountain Whernside is. In my honest opinion it is a grand mountain and so underrated. 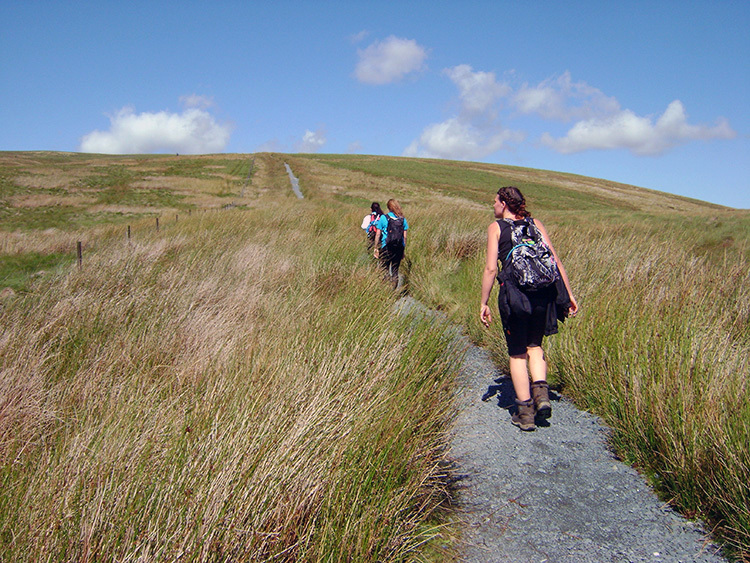 It has everything to offer, great paths to walk on it and great views to enjoy while on it including some of the best and most far reaching in all of the Yorkshire Dales. It has some of the most scenic tarns of all, Greensett Moss Tarn is special to me and I have not mentioned the enigmatic Whernside Tarns; seek them out. And finally, it is the biggest mountain in the Yorkshire Dales. Be proud of it. I am.